Visit Madrid's Plaza Mayor & Royal Palace; then see Gaudi's architectural masterpieces in Barcelona. This affordable 6-night self-guided vacation includes flights, transfers & all taxes. Choose your own departure date and airport. Visit England, United Kingdom soon! Select your dates to find the best pricing! These Europe hotel deals in England let you plan an international getaway that won’t break the bank. These Europe hotel deals in France will bring you one step closer to seeing the Eiffel Tower up close. See and eat your way through all of Italy when you book a hotel or vacation package in Europe. See Ireland’s city streets and endless fields and try a pint of Guinness with these Europe hotel deals. 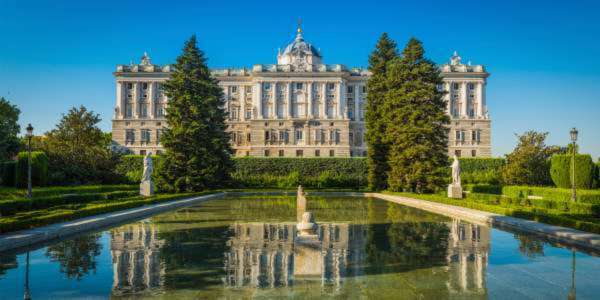 Visit Spain’s busy thoroughfares and popular museums with these European vacation packages in Barcelona or Madrid. Find great deals on amazing European hotels across cities, towns, and countries throughout the continent. Not sure where to go yet? Just put in your travel dates and we’ll show you some great deals across Europe so you can get some ideas for your trip! France – Perfect for romance and lovers of history and culture. Paris, one of the fashion capitals of the world, is home to iconic attractions such as the Eiffel Tower, the Champs-Elysees, the Louvre, and Notre Dame. Stay along the banks of the Seine River or the Promenade des Anglais for the most stunning scenery the city has to offer. Walk the same streets as Ernest Hemingway and don’t miss out on some authentic French bread. Find chateaus in the countryside for a relaxing stay close to France’s famous wines and vineyards. England – Relax at a bed and breakfast in a charming town or head to bustling London. Get up close and personal with sites like Buckingham Palace, Big Ben, and the open-air shops of the popular Covent Garden Market. London is great for families too, with museums, ginormous toy stores, and plenty of outdoor spaces for playtime. Italy – Say buongiorno to the best pasta and pizza of your life with a trip to Italian cities. Search European vacation packages and explore the canals of Venice, the ruins of Rome, and the wonders of Vatican City. Walk the colorful streets of Naples, tour fashionable Milan, or dine in picturesque Tuscany. Go ahead and plan that once-in-a-lifetime trip to Europe. With Dunhill Travel Deals, the work is already done for you. Just search our huge inventory of hotels across Europe to find the one that meets your needs. From lavish suites with private terraces, to affordable accommodations right in the city center, we’ve got exactly what you need. Search for Hotels & Compare Deals!